The 'Maoist(Maowadi) (labelled the People's War by then CPN(Maoist)) was an armed conflict against Government of Nepal (then HMG of Nepal) fought from 1996 to 2006. The rebellion was launched by the Communist Party of Nepal (Maoist) on 13 February 1996 with the main aim of overthrowing the Nepalese monarchy and establishing a 'People's Republic'. It ended with the Comprehensive Peace Accord signed on 21 November 2006. More than 19,000 people (including both civilian and armed forces) were killed during the conflict. "Inside Nepal's Revolution..... (just to check..!!!)". National Geographic Magazine, p. 54, November 2005. Douglas lists the following figures: "Nepalis killed by Maoists from 1996 to 2005: 4,500. Nepalis killed by government in same period: 8,200." and an estimated 100,000 to 150,000 people were internally displaced as a result of the conflict. This conflict disrupted the majority of rural development activities and led to a deep and complex Left Front which, together with the Nepali Congress, was the backbone of the broadbased movement for democratic change. However, communist groups uncomfortable with the alliance between ULF and Congress formed a parallel front, the United National People's Movement. The UNPM called for elections to a Constituent Assembly, and rejected compromises made by ULF and Congress with the royal house. In November 1990 the Communist Party of Nepal (Unity Centre) was formed, including key elements of constituents of UNPM. The new party held its first convention in 1991, the adopted a line of "protracted armed struggle on the route to a new democratic revolution" and that the party would remain an underground party. The CPN(UC) set up Samyukta Jana Morcha, with Baburam Bhattarai as its head, as an open front ten contest elections. In the 1991 elections, SJM became the third force in the Nepali parliament. However, disagreements surged regarding which tactics were to be used by the party. One sector argued for immediate armed revolution whereas others (including senior leaders like Nirmal Lama) claimed that Nepal was not yet ripe for armed struggle. In 1994 CPN(UC)/SJM was split in two. The militant faction later renamed itself the Communist Party of Nepal (Maoist). The Maoists labeled the government forces "feudal forces," and included in this accusation was the monarchy and the mainstream political parties. The armed struggle began soon afterward with simultaneous attacks on remote police stations and district headquarters. Initially, the Nepali government mobilized the Nepal Police to contain the insurgency. The Royal Nepal Army was not involved in direct fighting because the conflict was regarded as a matter for the police to sustain control. Furthermore, controversy grew regarding the army not assisting the police during insurgent attacks in remote areas. The popularly-elected prime minister resigned his post, due to the refusal of the Royal Army to take part in the conflict. This situation changed dramatically in 2002 when the first session of peace talks failed and the Maoists attacked an army barracks in Dang District in western Nepal. Overnight, the army was unleashed against the insurgents, mobilizing both tanks and artillery. 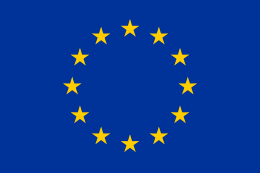 Under the aegis of the global War on Terrorism and with the stated goal of averting the development of a "failed state" that could serve as a source of regional and international instability, the United States, European Union, and India, among other nations, have provided extensive military and economic aid to the Nepali government. This material support to the Nepali government dried up after King Gyanendra seized full control in February 2005 to get rid of civil war for once and all. The government responded to the rebellion by banning provocative statements about the monarchy, imprisoning journalists, and shutting down newspapers accused of siding with the insurgents. Several rounds of negotiations, accompanied by temporary cease-fires, were held between the insurgents and the government. The government categorically rejected the insurgents' demand for an election to the constituent assembly; it would result in the abolition of the monarchy by a popular vote. At the same time, the Maoists refused to recognize the installation of a constitutional monarchy. In November 2004, the government rejected the Maoists' request to negotiate directly with the King Gyanendra rather than via the Prime Minister Sher Bahadur Deuba; their request for discussions to be mediated by a third party, such as the United Nations was dismissed. Throughout war, the government controlled the main cities and towns, whilst the Maoist dominated the rural areas. Historically, the presence of the Nepali government has been limited to town and zonal centers. The only state apparatus present in most small villages, where most of the inhabitants of Nepal live, were a health post, a government school, a village council, and a police booth. Once the insurgency began, the schools were all that remained, indicating that the Maoists had seized control of the village. The Royal government powerbase was located in the zonal headquarters and the capital Kathmandu. Unrest reached Kathmandu in 2004 when the Maoists announced a blockade of the capital city. Intense fighting and civic unrest continued well into 2005, with the death toll rising to 200 in December 2004. On 1 February 2005, in response to the inability of the relatively democratic government to restore order, King Gyanendra assumed total control of the government. He proclaimed, "Democracy and progress contradict one another... In pursuit of liberalism, we should never overlook an important aspect of our conduct, namely discipline." On 22 November 2005, Maoists,the joint CPN(M)–United People's Front conference in Delhi issued a 12-point resolution, stating that they "...completely agree that autocratic monarchy is the main hurdle" hindering the realisation of "democracy, peace, prosperity, social advancement and a free and sovereign Nepal." In addition, "It is our clear view that without establishing absolute democracy by ending autocratic monarchy, there is no possibility of peace, progress, and prosperity in the country. "Since their formation in 1994,they were in arms for the establishment of democracy in Nepal.Unlike other communists they support democracy and Multi- party system in Nepal. An understanding had been reached to establish absolute democracy by ending monarchy with the respective forces centralizing their assault against monarchy thereby creating a nationwide storm of democratic protests. This marked a departure from the previous stance of the CPN(M), which had so far vehemently opposed the gradual process of democratization advocated by the UPF. As a result of the civil war, Nepal's greatest source of foreign currency, its tourism industry, suffered considerably. Travel company iExplore published rankings of the popularity of tourist destinations, based on their sales, which indicated that Nepal had gone from being the tenth most popular destination among adventure travelers, to the twenty-seventh. The conflict forced the young and able to seek work abroad in order to avoid the human rights violations committed by the government forces and the crimes committed by the Maoists. These guest workers work predominantly in the Gulf (Qatar, Saudi Arabia, etc.) and Southeast Asia (Malaysia etc.). The regular flow of remittances from these labourers has permitted the country to avoid serious economic crisis or economic bankruptcy. The economy of Nepal is heavily dependent on the infusion of foreign income from the guest workers (similar to the Lebanese economy during its civil war). The Nepalese Army (NA) took final control over the People's Liberation Army (PLA), the armed wing of the Unified Communist Party of Nepal (Maoist), on 10 April 2012. Prime Minister (PM) Baburam Bhattarai, who also heads the Army Integration Special Committee (AISC), told the committee on 10 April 2012, that the NA was going to move into all 15 PLA cantonments, take full control, and seize more than 3,000 weapons locked in containers lying there. He added that the process would be completed by the evening of 12 April. However, following reports of clashes in the cantonments, the PM met the NA chief, Chhattra Man Singh Gurung, in the evening of 10 April, and directed him to implement the decisions of the AISC. NA troops took charge of the cantonments and the weapons’ containers the same day. This vitiated the environment in the cantonments. Consequently, the process was halted on 10 April at the request of the Maoist leadership. It was, however, restarted on 13 April, and, as of 19 April 2012, when it was finally concluded, there were 3,129 former PLA combatants left for integration into the NA. A total of 6,576 combatants chose the Voluntary Retirement Scheme (VRS), that promises cheques in the range of NPR 500,000 to NPR 800,000, depending on their ranks. In the first phase ( 18 to 1 November December 2011) of regrouping, 9,705 former combatants had chosen integration into the NA. In a landmark achievement, the AISC had initiated the process of integration following a 1 November 2011, seven-point deal signed by three major political parties – UCPN-M, Communist Party of Nepal (Unified Marxist-Leninist) (CPN-UML) and Nepali Congress (NC) – and the umbrella formation of several Madheshi groups, the United Democratic Madhesi Front (UDMF). The deal provided three options to former PLA combatants – integration, voluntary retirement and rehabilitation. 9,705 combatants opted for integration, 7,286 chose voluntary discharge, and six combatants registered their names for rehabilitation packages. The United Nations Mission in Nepal (UNMIN) had registered 19,602 combatants in the second verification conducted on 26 May 2007. An 14 April 2012, AISC decision laid down that the ranks of the integrated combatants would be determined according to the NA's, and not the PLA's, standards. 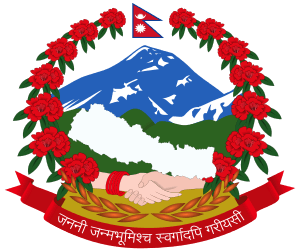 A Selection Committee would be headed by the Chairman of Nepal's Public Service Commission (PSC) or by a member appointed by him, and a General Directorate would be created under the NA, headed by a Lieutenant General, to absorb the integrated combatants. The combatants will have to undergo between three and nine months of training, depending on their ranks. The Directorate would only be deployed for disaster relief, industrial security, development, and forest and environment conservation. On 17 April, the NA stated that it could not start the recruitment process of former Maoist combatants until the structure—leadership and size—of the General Directorate had been finalised at the political level. On 19 April 2012, the three major political parties agreed to merge two separate proposed commissions on Truth and Reconciliation, and on Disappearances, into one. Kathmandu: A soft-drink bottling factory owned by a multi-national company is attacked and the building torched. January: The government creates the Armed Police Force, a Paramilitary force to fight the insurgents. 28 May: Chairman Prachanda gives an interview with the Communist journal A World to Win. 1 June: King Birendra and most of the royal family are killed in the Nepali royal massacre. Dipendra is accused for the royal massacre and 'suicide attempt'. Dipendra, supposedly comatose after a failed suicide attempt or assassination attempt by palace guards, is crowned king, according to tradition. He supposedly died on 4 June although his body seemed to have started to decompose in four days and flies were seen orbiting around his corpse, Gyanendra is crowned King. 3 August: The first round of peace talks begin. 23 November: Peace talks collapse when the Maoists withdraw and launch a ferocious attack Police and Army posts in 42 districts, in which 186 Army and Police personnel and 21 Maoists are killed. 26 November: The government of Sher Bahadur Deuba declares a Nationwide State of Emergency and employs the Nepal Army in attacking the Maoists. May: Large battles fought between Army and Maoist forces at Lisne Lekh along boundary between Pyuthan and Rolpa districts, and in Gam village, Rolpa. 11 May: A photograph is discovered by Nepal government soldiers in western Nepal. The photograph depicts Nepal's Maoist rebel leaders Baburam Bhattarai, Hisila Yami, Ram Bahadur Thapa (alias Badal), and Pushpa Kamal Dahal (alias Prachanda). 22 May: King Gyanendra, acting on the advice of Prime Minister Sher Bahadur Deuba, dissolves Parliament and orders new elections. The reason given for the dissolution is opposition to the state of emergency. 11 July: Information leaks out that the Belgian weapon manufacturer FN Herstal is allowed to deliver 5,500 M249 SAW light machine guns to the Nepali monarchy, a decision made by all coalition parties. Minister of External Affairs Louis Michel speaks of "a country in a pluralistic democracy." 4 October: King Gyanendra deposes Prime Minister Deuba and the entire Council of Ministers, assumes executive power, and cancels the elections for the dissolved House of Representatives, which had been scheduled for 11 November. 11 October: King Gyanendra appoints Lokendra Bahadur Chand as Prime Minister. January: The United States hold exercises with the Nepali army. Maoist insurgents kill the Inspector General of Armed Police, Krishna Mohan Shrestha, his wife and his bodyguard, Head Constable Subhash Bahadur Gurung of the Armed Police Force Nepal, while on their morning walk, as they used to do on Sunday mornings, intending to represent general safety to fellow citizens. The Inspector General and his wife, who was a teacher at an international school in the capital, were both unarmed. They were riddled with bullets from Type 56 Rifles and G3 rifles used by the Maoists. 29 January: A second ceasefire is established and peace talks begin. 17 August: Nepali Military and Police forces kill 39 Maoist rebels in the Ramechhap District of central Nepal during an offensive launched jointly by the Army, Police, and Air Force of Nepal. 7 Soldiers of the Nepali Army and 5 Constables of the Armed Police are also killed in the operation. 24 August: The Maoists set an ultimatum, threatening to withdraw from the cease-fire if the government does not agree within 48 hours to include the question of the Maoists participating in the Constituent Assembly. 26 August: The Maoist ultimatum expires. The Maoists unilaterally withdraw from the 29 January cease-fire. Prachanda's statement revives the rebels' demand for an end to monarchic rule in favor of a "people's republic", stating, "Since the old regime has put an end to the forward-looking solution to all existing problems through the cease-fire and peace talks, we herein declare that the rationale behind cease-fire...and peace process has ended." 27 September: "Fifteen people including 8 Rebels and 4 Policemen were killed on Saturday and suspected Maoists bombed five government utilities despite the guerrillas' plans for a nine-day truce from 2 October, officials said. Eight Maoists were killed in a gun battle with security forces at Chhita Pokhara in the Khotang District, 340 kilometres east of Kathmandu, a police officer said. 4 Policemen were also killed. Elsewhere in eastern Nepal, the Maoists killed two Policemen, Constable Purna Prasad Sharma and Head Constable Radha Krishna Gurung, and a woman selling beetle nuts, Kali Tamang, in the Jaljale-Gaighat area, an official said. 'A group of seven Maoists descended from a public bus when police were checking the passengers and suddenly opened fire from an automatic pistol, killing the three and wounding two others,' said Sitaram Prasad Pokharel, the chief administrator for the region. In Janakpur, an industrial hub on the Indian border 260 kilometres south-east of Kathmandu, the Maoists under the direct command of Prachanda carried out five early morning bombings that disrupted telephone service and power, police said. No one was killed directly by the blasts but an elderly man died of a heart attack after hearing the explosions, Police Deputy Superintendent Bharat Chhetri said. He said the sites that were bombed included the offices of the roads department and the Nepal Electricity Authority and a telecommunications tower. Police personnel and Maoists traded fire for nearly 40 minutes after the blasts but the rebels escaped and 37 people were injured, Mr Khadka said." 13 October: At least 42 Police Recruits and 9 Maoists are killed when an estimated 3,000 Maoists attempt to storm a Police Training Center in Bhaluwang. "'The rebels had snapped telephone cables, set up roadblocks by felling trees or blowing up highway bridges to prevent reinforcements from coming,' a witness, Krishna Adhikary, told Reuters." 27 October: " Colonel Adrian Griffith and six Nepali nationals were freed last week 42 hours after being taken captive in Baglung, 300 km (190 mi) west of Kathmandu, while on a drive to recruit young Gurkha soldiers to serve in the British army." Party chief Prachanda said, "We are sorry for the incident that took place against the policy of the party." 11 November: The government Defence Ministry accuses the Maoists of abducting twenty-nine 9th- and 10th-grade students from Riva Secondary School in Mugu District, western Nepal during the previous week. 19 November: According to a Nepal army official, four people were caught at the Chinese Khasa border point, 114 kilometers northeast of Kathmandu, smuggling weapons from Tibet into Nepal. The official named Hirala Lal Shrestha and Gyaljen Sherpa and said they were taken for interrogation in the Tibetan town of Xigatse. 5 February: An Army raid is carried out by the Bhairavnath Battalion on a village in Bhimad, Makwanpur District. Reports emerge that 14 suspected Maoist rebels and two civilians were executed after being captured. Amnesty International later wrote a letter to Prime Minister Surya Bahadur Thapa and Brigadier-General Nilendra Aryal, Head of the Royal Nepal Army (RNA) human rights cell, demanding an immediate inquiry. 10 February: Two central committee members of the CPN-M, Matrika Yadav and Suresh Paswan, are reported to have been handed over by India to Nepal. They were reportedly arrested in Lucknow after Nepal provided information. 13 February: Ganesh Chilwal leads an anti-Maoist protest on this day, the eighth anniversary of the commencement of the revolution. 15 February: Ganesh Chilwal is shot dead in his Kathmandu office by two suspected Maoists. 15 February: Fighting erupts at a Maoist jungle base in Kalikot District, 360 km west of Kathmandu. The base is said to hold 5000 Maoist troops. On 17 February, a security official says that a private helicopter flying troops to Kalikot was hit by Maoist fire but that it returned safely to Kathmandu. On 18 February 65 Maoists are reported to have been killed, though this conflicts with other reported death tolls of 35 and 48. 15 February and 16: Nepalese state radio reports that 13 Maoist rebels were killed in seven separate small clashes with security forces across the country. 18 February: Lawmaker Khem Narayan Faujdar, a member of the parliament dissolved by King Gyanendra in 2002, is shot dead by two suspected Maoists riding a motorcycle in the Nawalparasi District, 200 km southwest of the capital, according to the police. 2 April: The largest rallies since 1990 begin in Kathmandu. They are variously labelled "pro-democracy" and "anti-monarchy." 3 April: More than 12 trucks are burnt while waiting at a western Nepal border post to pick up petrol from India. India condemns the attacks and vows to fight terrorism. 4 April "Hundreds of Maoist rebels" attack a Police outpost in Yadukuwa, Jadukhola. 13 policemen are killed, 7 wounded, and 35 are listed as missing. 8–9 Maoists are also killed. "Witnesses said more than 500 rebels attacked the Police post and began firing Assault Rifles and RPG-7 rockets. at around 9 pm (1515 GMT) on Sunday night. The fighting lasted two to three hours." Other reports state 400 rebels. 4 April: In the west of the country three Indian traders are shot and injured and have their vehicles burned. 5 April: A three-day national strike begins, called by CPN(M) and opposed by an "alliance of five political parties" who are protesting in Kathmandu against the monarchy and say the strike will hamper the movement of demonstrators in Kathmandu. Prachanda said, "The time has come to win a united struggle against the feudal forces as the king is trying to take the nation back to the 18th century." 5 April: In the morning, 3 soldiers are killed and 7 injured by a CPN(M) landmine activated by their vehicle at Dhalkhola, 50 km east of Kathmandu. 5 April: At least 140 people are injured in clashes in Kathmandu as "about 50,000" demonstrators confront the police. Demonstrators try to break through a police barricade close to the royal palace. The police respond with tear gas and protesters are reportedly injured by police batons. Rocks and bricks are thrown by both sides. Demonstrations also occur in Lalitpur and Bhaktapur. Meanwhile, king Gyanendra has reportedly been away touring villages in western Nepal. 5 April: The Indian government announces that it will no longer provide police escorts to Indian officials shopping in Nepal, as a means to discourage such trips. Fears are based on the CPN(M) targeting Indians. "We are worried about possible reprisals here if the Maoists continue to target Indians inside Nepal," said a senior police official. 16 August: The Soaltee Hotel, a popular luxury hotel in Kathmandu, is bombed, after refusing a demand from the Maoists that the hotel close. 18 August: A bomb explodes in a marketplace in southern Nepal. The blast kills a 12-year-old boy and wounds six others, including three policemen. In addition, Maoist rebels, demanding the release of captured guerrillas, stop all road traffic near Kathmandu by threatening to attack vehicles. Some Nepal businesses are shut down because of threats. 10 September: A bomb explodes at the United States Information Service office in Kathmandu. 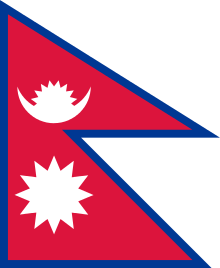 13 September: U.S. Peace Corps suspends operations and non-essential U.S. Embassy personnel are evacuated from Nepal. 9 November: 36 people were injured when suspected Maoist rebels exploded a powerful bomb at an under-construction government office complex,the Karmachari Sanchaya Kosh Office Complex in the heart of Nepalese capital Kathmandu Tuesday. 11 November : Maoists kill NID Deputy Superintendent of Police Hemraj Regmi in front of his office residence in Butwal municipality-6 in Rupandehi district. 15 December: Twenty government security personnel are killed in the western district of Arghakhanchi when the Maoists mount a surprise attack. 16 December: Sixteen Maoist rebels are killed in clashes with Nepali security forces in the western district of Dailekh. 23 December: Maoist forces launch blockade of Kathmandu. 26 December: Over 15,000 hold peace rally in Kathmandu. 2 January: Nepali media reports two children being killed in Dailekh District by a Maoist bomb. 4 January: Three government security personnel and between two and twenty-four Maoist rebels reported killed in fighting. 8 January: Maoists detain and later release 300 passengers from six buses that defy their blockade of Kathmandu. 10 January: Prime Minister Deuba said he would increase defense spending to fight the Maoists unless they come forward for talks with the government. 11 January: Protests and blockades over the government fuel price increases of between 10% and 25%. 15 January: Maoists allegedly detain 14 Indian Gurkhas from Chuha village in Kailali. 1 February: King Gyanendra dissolves the Deuba government and bans all news reports. The army begins arresting senior political leaders, journalists, trade unionists, human rights activists and civil society leaders. All telephone and internet connections are cut. 6 June: Badarmude bus explosion: Some 38 civilians are killed and over 70 injured after a packed passenger bus runs over a rebel landmine in Chitwan District. 9 August: Maoist rebels kill 40 security men in midwestern Nepal. 3 September: The Maoists declare a three-month unilateral ceasefire to woo opposition political parties. 19 November: After negotiations, the Maoist rebels agree to work with opposition politicians in a common front against the rule of King Gyanendra of Nepal. 2 January: Rebels decide not to extend a four-month ceasefire saying that the government had broken the ceasefire with numerous attacks on Maoist villages. 14 January: Maoists launch coordinated attacks of five military and paramilitary targets in the Kathmandu Valley. The first demonstration of their ability to organize violence within the Valley, prompting curfews at night for the next several days. 14 March: Nepali rebels extend road blockade; nationwide strike called for 3 April. 5 April: General strike begins with Maoist forces promising to refrain from violence. 6 April 7: Protesters clash with police, hundreds arrested, dozens injured. 8 April: A curfew is imposed in Kathmandu from 10 pm to 9 am The king orders protesters violating the curfew to be "shot on sight." 9 April: General strike scheduled to end. Government extends curfew, BBC reports. Three dead in two days of unrest, as thousands of demonstrators defy curfews. 27 April: Maoist insurgents, responding to a demand by the newly appointed Prime Minister Girija Prasad Koirala, announce a unilateral three-month truce after weeks of pro-democracy protests in Kathmandu, and encourage the formation of a new constituent assembly tasked with rewriting the nation's constitution. 3 May: Nepal's new cabinet declares a ceasefire. This was not taken very seriously. The cabinet also announces that the Maoist rebels will no longer be considered a terrorist group. Rebels are also encouraged to open peace talks. 21 November: Peace talks end with the signing of the Comprehensive Peace Accord between Prime Minister Koirala and Maoist leader Prachanda. The deal allows the Maoists to take part in government, and places their weapons under UN monitoring. In July 2007, the Ministry of Peace and Reconstruction proposed legislation that would establish a Truth and Reconciliation Commission in Nepal. The parliament is setting up a Truth and Reconciliation Commission to investigate wartime killings, torture and forced disappearances and is debating proposals to grant an amnesty for abuses by government and rebel forces. 1 2 Ed Douglas. "Inside Nepal's Revolution..... (just to check..!!!)". National Geographic Magazine, p. 54, November 2005. Douglas lists the following figures: "Nepalis killed by Maoists from 1996 to 2005: 4,500. Nepalis killed by government in same period: 8,200." ↑ "Anti-king remarks intolerable: Lohani". NepalNews: The Kathmandu Post. 20 December 2003. Archived from the original on 14 November 2004. Retrieved 22 November 2006. 1 2 3 4 5 6 7 8 9 10 11 12 13 14 15 16 17 18 19 20 "Nepal: Consolidating The Peace – Analysis". Eurasia Review. Retrieved 24 April 2012. ↑ "However tortuous the road may be, the victory of the world proletarian revolution is certain". Human Rights Server. 28 May 2001. ↑ Greenwald, Jeff (13 June 2001). "Murder and intrigue in Katmandu". World Tibet Network News. Archived from the original on 24 August 2006. Retrieved 22 November 2006. 1 2 3 4 5 6 7 8 9 Pokharel, Tilak P (27 August 2003). "Nepali Rebels Walk Away from Peace Talks". World Press. Retrieved 22 November 2006. 1 2 Miglani, Sanjeev (18 August 2003). "Nepal's Maoist cauldron draws foreign powers closer". ReliefWeb. ↑ Adhikari, Bipin (19 March 2003). "Code of conduct as a point of departure". The Kathmandu Post. ↑ "More die in Nepal Maoist insurgency despite truce call". ABC News Online. 28 September 2003. Archived from the original on 3 October 2003. ↑ "37 killed as Maoist army attacks camp". The Telegraph. 14 October 2003. ↑ Sharma, Sushil (27 October 2003). "Maoists 'sorry' UK officer held". BBC News. ↑ "How anti-monarchy movement took shape". The Independent. ↑ "China arrests four Nepali Maoists for arms smuggling". Daily News. 20 November 2003. Archived from the original on 6 December 2003. ↑ "Nepal: Extra-judicial killings inquiry urgent". Scoop. 18 February 2004. Retrieved 22 November 2006. ↑ "India hands over two Maoist leaders to Nepal". The Times of India. 10 February 2004. 1 2 "Nepal anti-rebel leader shot dead". BBC News. 15 February 2004. 1 2 "48 Maoist rebels killed in Nepal army attacks". KuraKani. 17 February 2004. ↑ "Chronology of decade-long conflict". ReliefWeb. 22 November 2006. ↑ Sharma, Gopal (9 April 2004). "Nepal parties plan anti-monarchy rally". Independent Online. 1 2 "140 Injured As Clashes Rock Nepal's Capital". INDOlink. 5 April 2004. 1 2 3 4 "Maoist rebels storm police post in Nepal, kill 9". Utusan Online. 5 April 2004. ↑ "9 policemen dead as Maoists storm post in Nepal". INQ7. 5 April 2004. ↑ "Rebels storm police post, kill nine officers". Gulfnews. 6 April 2004. ↑ "Maoists kill 9 policemen". The Telegraph. 5 April 2004. ↑ Singh, Kedar Man (3 April 2004). "Anti-monarchy protesters pack streets of Kathmandu". INQ7. ↑ "Major parties take to the streets in Nepal". The Hindu. 14 March 2004. ↑ "Police want 'shopping trip' slowdown in Nepal". The Statesman. India. 5 April 2004. Archived from the original on 12 June 2008. ↑ "Nepal rebels ready to surrender under UN supervision". The Times of India. 20 November 2005. Retrieved 22 November 2006. ↑ Sharma, Nagendar (18 November 2005). "Nepal opposition in Maoist talks". BBC News. Retrieved 22 November 2006. ↑ Pasricha, Anjana (2 January 2006). "Nepal Rebels Call Off Four-Month Truce". Voice of America. Retrieved 22 November 2006. ↑ "Nepal rebels call for indefinite strike against king". The Boston Globe. 18 February 2006. Archived from the original on 25 July 2012. ↑ Gurubacharya, Binaj (8 April 2006). "Anti-monarchy rallies spread in Nepal". The Boston Globe. 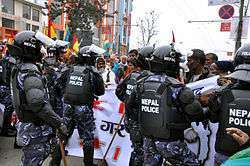 ↑ "Violent clashes amid Nepal curfew". BBC News. 10 April 2006. Retrieved 22 November 2006. ↑ "Nepal Maoist rebels declare truce". BBC News. 27 April 2006. Retrieved 22 November 2006. ↑ "Nepal's Maoists Declare Ceasefire". Voice of America. 27 April 2006. Retrieved 22 November 2006. ↑ "Nepal calls ceasefire with rebels". BBC News. 3 May 2006. Retrieved 22 November 2006. ↑ "Peace deal ends Nepal's civil war". BBC News. 21 November 2006. Retrieved 22 November 2006.